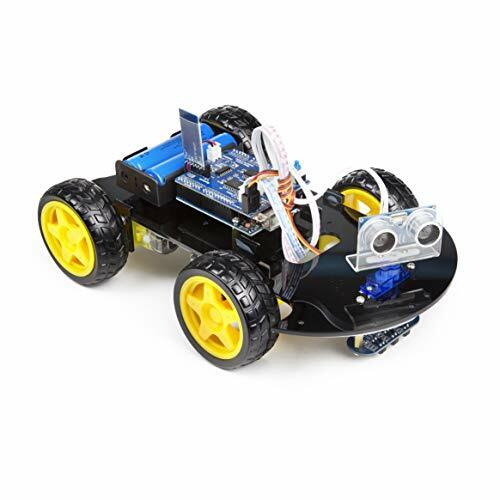 Designed for education, competition, and entertainment, this flexible vehicular kit supports IR remote control and mobile app control. It is an easy and fun introduction to Arduino and robotics, and usually used in classrooms, summer camps, research projects, etc. It has a complete set of modules and components, and almost everything needed to run the car is in the package, including batteries and a battery charger. COMPLETE SETS OF MODULES - UNO R3 board for Arduino, Bluetooth and line tracking module, ultrasonic sensor, motor drive board, 9g micro servo motor, etc. Battery and charger are also included, almost everything needed to run the car in the package.